Search engine optimisation or SEO has established itself as a marketing discipline over the last years. Parallel to the shift of sales from traditional stores to online magazines the interest in SEO consultancy has grown on a constant basis. As the chart shows clearly: SEO keep being of interest to Google users. The chart is taken from the Google-Trends website where one can gain information about search volums for a particular keyword, and this can be as detailed as for one country or one region only. A solid use of the trends-tool is essential for a proper keyword analysis. 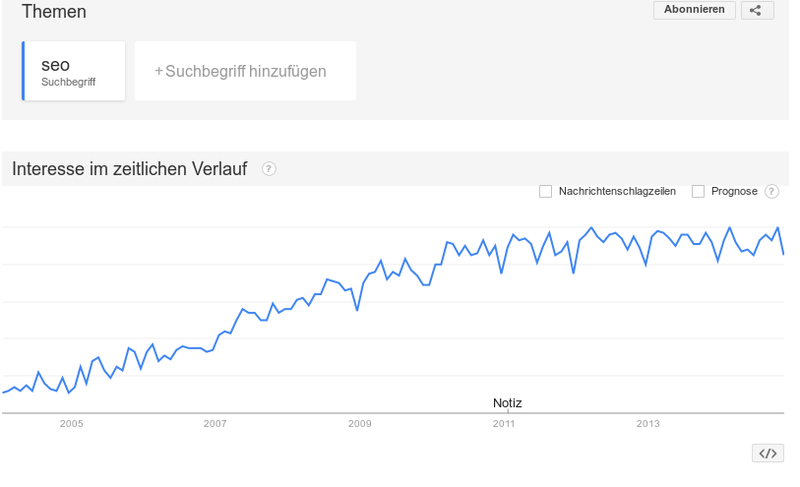 As you see: SEO in Germany (the chart displays the volume for Germany only) has grown until 2011 and since then was stable with a slightly positive tendency.